Agile! We make you more productive! MPro® is a Membership Registration and Administration Software Solution. It is a windows based Member management system, with the ability to run across the Web. It is designed for associations, clubs and organizations, large or small. MPro®-Online integrates with the Web for both end-users and administrators. 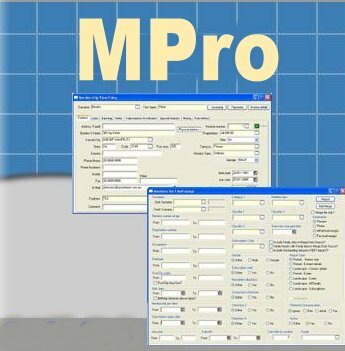 MPro® is a modular and highly customizable membership management software application suitable for a variety of applications from small groups, single station computer, low budget to large organization, multiple users over a network with complex requirements. MPro® can be configured to suit your requirements to achieve a solution to your needs. We offer a range of licensing options from single user to multi-user; less than 1000 member records to unlimited records. » Relationship of a member to an external organization e.g. employer, sponsor, etc. » Displays warnings re expenses outstanding, inactive membership etc. Serving Nigeria and West Africa!